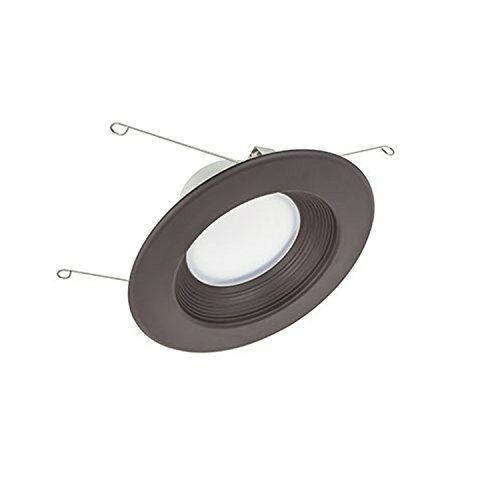 American Lighting E56-B30-DB epic 56 LED recessed down light module baffle 3000K, 5-6", Dark Bronze. Versatile and affordable family that includes 11 retrofit options for a recessed round LED down light, and square trims in 3 finishes that quickly and easily click on for a completely different look. High CRI (90+) retrofits are dimmable with most standard incandescent (triac) and low voltage electronic dimmers for 5-100% light control. Energy star pending. Metal core PCB with aluminum heat sink and 99% diffuse reflecting Cone for optimum longevity and light output. Stamped aluminum with durable baked enamel finish trims. The new epic 5/6-inch for both 5 inch and 6 inch housings combines smart versatility, with high CRI and affordability. Upgrade to a modern square look with simple click-on trims, available in 3 finishes, in smooth or baffled insets. Pre-set for 6 inch can installation - slide torsion spring mounting brackets towards light module to adjust for use with 5 inch cans, and requires only 4 inch high clearance. Frosted polycarbonate lens diffuses light. Cetlus listed for type IC and wet locations.